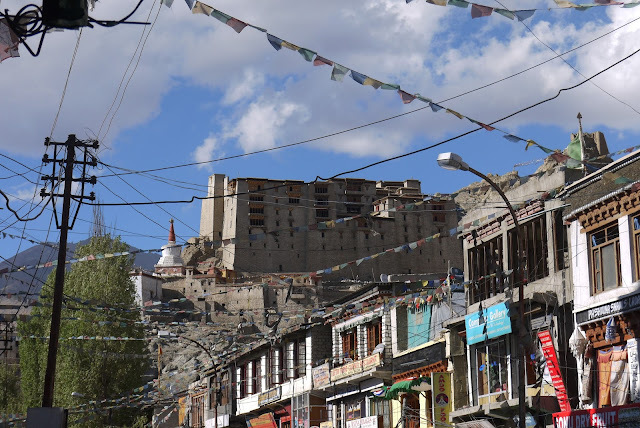 Have had three nights in Leh, the capital of Ladakh, for acclimatisation before starting the trek proper. I guess one of the downsides of this trip is that you have to hang about to get ready for the altitude - no opportunity for a gradual climb - and after three days in Leh (3,500 metres) it's a car journey to Rumtse (4,200 metres) after which you're quickly into 5,000 metre plus territory. Theoretically the Leh stopover provides a chance to rest and recover from the journey but unfortunately that didn't work out for Christine and me. 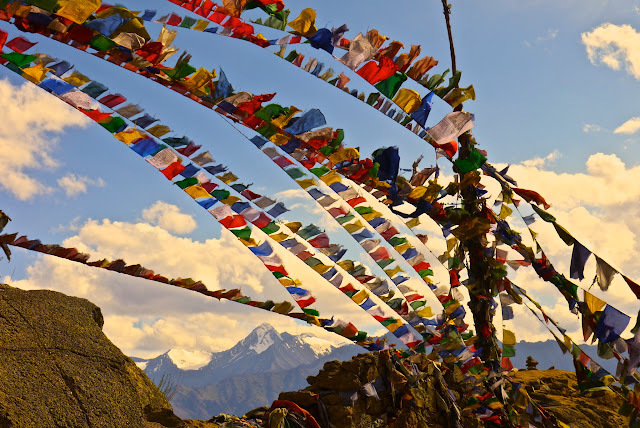 Catching the early morning flight from Delhi to Leh required a 2 o'clock wake up call but with the air-conditioning in our bedroom on full blast and the ceiling fan set to maximum we were in any event wide awake. If you're lucky you get to see K2 on the flight but today it was just too cloudy. The landing however was spectacular with the plane spiralling down and almost touching the mountains in its descent to the airport. Leh airport doubles as a military base and photography is strictly forbidden. When we arrived there were two huge Antonov An-124 transport planes on the runway, helicopters buzzing around overhead and Indian Army troops everywhere. Leh is a nice town - a trekking town and in late July full of backpackers, gap-year students and parties like us waiting to start their trip. As far as we are concerned it has one fundamental draw back - dogs. In the daytime you don't really notice them - they are all asleep under the trees getting ready to party. At about midnight it starts and the whole valley seems to howl in unison. Worse, little packs form which charge along the alleys like demented foxhounds. Our room in an otherwise nice hotel was right next to one of these alleys and of course once you have heard one pack charge along it you just lie awake waiting for the next one. At about 3-30am things start to go quiet, although there is a final chorus kicked off we concluded by the early morning imman's call to prayers. I asked Dilip (our leader who comes from Leh) why the locals don't do something about the dogs. He told me that because many of them are Buddists the obvious solution isn't available. They did round the dogs up once and ferried them to another valley but unfortunately they all came back again. On the second day we ventured out of Leh and explored some of the Buddhist heritage visiting the Shey and Thiksey Monasteries. Both buildings are set high with great views. Shey is on the side of the main valley and Thiksey, said to resemble Lhasa, on a hill in it. We walked the couple of miles across the valley from Shey to Thiksey and the heat was intense. 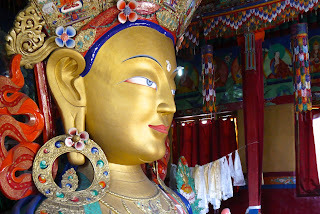 The best thing about the monasteries for me were the huge colourful Budda statues, much bigger than anything you would find in a western church, which with their bold stripped down fresh designs could easy have stood alongside Mickey Mouse in Disneyland. On the third day we all took the optional trip up to the Khardung Pass which at 5,604 metres is the highest you can go in a motorised vehicle in the world (although the Chinese are about to build an even higher pass). It was a great trip but freezing cold at the top when we were there. On the way up we passed a European cyclist on a mountain bike with panniers, clawing his way up the dirt road, amazing, it must have taken him months to get fit enough to make such a trip. The Indian Army had a strong presence on the pass reflecting the fact that just around the corner, across the Siachen Glacier, they are eyeball to eyeball with the Pakistani Army. The "ownership" of glacier, which is the second longest non-polar glacier in world, is disputed and was fought over throughout the 80s and 90s. Both sides continue to maintain large numbers of troops on the mountain tops in what must be the extreme posting in the world. Heading back down the track we were held up for a while by "roadworks" although nothing like the roadworks you get on the M25. 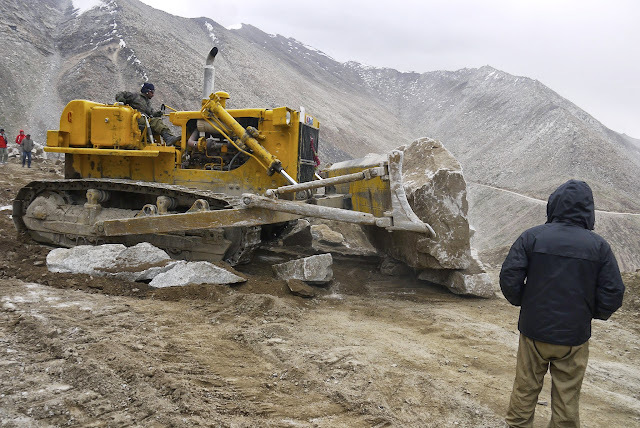 A huge bulldozer, driven by a particularly cool driver in designer sunglasses, was clearing a landslide by pushing massive boulders off the road and down the mountainside in a particularly entertaining way. 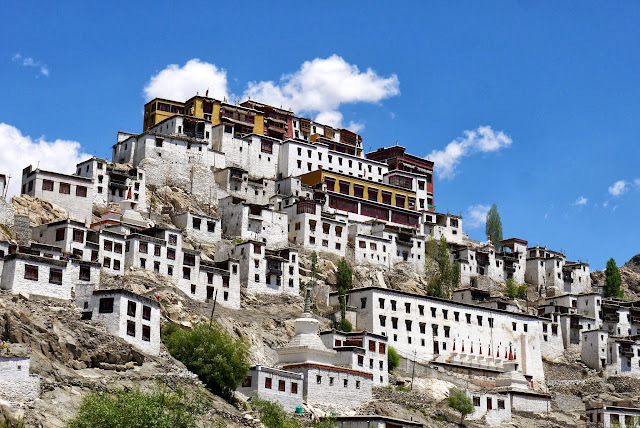 In the afternoon we visited the Tsemo monastery in Leh and the Japanese Peace Pagoda. Christine was not well and by early evening my guts had joined hers in protest. We both had a dose of food poisoning (we shared a chicken tandoori in the restaurant the night before) and so in addition to being entertained by howling dogs I spent my last night in Leh very close to the toilet. I have heard many praising words about bike riding in Leh and currently planning for summer trip to Ladakh. I also have collected online and also have planned a trip itinerary. As it is my first visit so I am very nervous about the trip. Your article is just like a best source of Leh tourist information. As you have posted your about your own traveling experience. Thanks for the post.